Hiram Bingham III (November 19, 1875 – June 6, 1956) was an American academic, explorer and politician. He made public the existence of the Inca citadel of Machu Picchu in 1911 with the guidance of local indigenous farmers. Later, Bingham served as a member of the United States Senate for the state of Connecticut. Bingham was born in Honolulu, Hawaii, the son of Clara Brewster and Hiram Bingham II (1831–1908), an early Protestant missionary to the Kingdom of Hawai'i, the grandson of Hiram Bingham I (1789–1869) and Sybil Moseley Bingham (1792-1848), earlier missionaries. He attended O'ahu College, now known as Punahou School, from 1882 to 1892. He went to the United States in his teens in order to complete his education, entering Phillips Academy in Andover, Massachusetts, from which he graduated in 1894. He earned a B.A. degree from Yale College in 1898, a degree from the University of California, Berkeley in 1900, where he took one of the first courses on Latin American history offered in the United States, and Ph. D. from Harvard University in 1905. Since Harvard at the time did not have a specialist in Latin American history, Edward Gaylord Bourne of Yale served as the examiner for Bingham's qualifying exams. While at Yale, Bingham was a member of Acacia Fraternity. He taught history and politics at Harvard and then served as preceptor under Woodrow Wilson at Princeton University. Princeton "did not much favor Latin American history," so in 1907, when Yale sought a replacement for Bourne, who had died an early death, it appointed Bingham as a lecturer in South American history. Bingham was one of the pioneers of teaching and research on Latin American history in the U.S. In 1908, he published an assessment of the field's prospects, "The Possibilities of South American History and Politics as a Field for Research," in which he surveyed library and archival resources in the U.S. as well as in South America. From 1924, he was a member of the Acorn Club. Bingham was not a trained archaeologist. Yet it was during Bingham's time as a lecturer and professor in South American history at Yale that he rediscovered the largely forgotten Inca city of Machu Picchu. In 1908 he had served as delegate to the First Pan American Scientific Congress at Santiago, Chile. On his way home via Peru, a local prefect convinced him to visit the pre-Columbian city of Choquequirao. Bingham published an account of this trip in Across South America; an account of a journey from Buenos Aires to Lima by way of Potosí, with notes on Brazil, Argentina, Bolivia, Chile, and Peru. Bingham was thrilled by the prospect of unexplored Inca cities, and organized the 1911 Yale Peruvian Expedition, one of the objectives of which was to search for the last capital of the Incas. Guided by locals, he rediscovered and correctly identified both Vitcos (then called Rosaspata) and Vilcabamba (then called Espíritu Pampa), which he named "Eromboni Pampa", but did not correctly recognize Vilcabamba as the last capital, instead continuing onward and misidentifying Machu Picchu as the "Lost City of the Incas". Decades later, Bingham's oversight was rectified by the Andean explorer Vince Lee, whose detailed researches proved that Vilcabamba was indeed the Incas' last capital. On July 24, 1911, Melchor Arteaga led Bingham to Machu Picchu, which had been largely forgotten by everybody except the small number of people living in the immediate valley (possibly including two local missionaries named Thomas Payne and Stuart McNairn whose descendants claim that they had already climbed to the ruins in 1906). Also the Cusco explorers Enrique Palma, Gabino Sanchez and Agustín Lizarraga are said to have arrived at the site in 1901. Bingham returned to Peru in 1912, 1914 and 1915 with the support of Yale and the National Geographic Society. In The Lost City of the Incas (1948), Bingham related how he came to believe that Machu Picchu housed a major religious shrine and served as a training center for religious leaders. Modern archaeological research has since determined that the site was not a religious center but a royal estate to which Inca leaders and their entourage repaired during the Andean summer. A key element of the expeditions' legacy are the collections of exotic animals, antiquities, and human skeletal remains. These objects exposed the modern world to a new view of ancient Peru and allowed 20th-century interpreters to interpret Machu Picchu as a "lost city" that Bingham "scientifically discovered". Bingham merged his reliance on prospecting by local huaqueros with the notion that science had a sovereign claim on all artifacts that might contribute to the accumulation of knowledge. Machu Picchu has become one of the major tourist attractions in South America, and Bingham is recognized as the man who brought the site to world attention, although many others helped. The switchback-filled road that carries tourist buses to the site from the Urubamba River is called the Hiram Bingham Highway. Bingham has been cited as one possible basis for the character Indiana Jones. His book Lost City of the Incas became a bestseller upon its publication in 1948. Peru has long sought the return of the estimated 40,000 artifacts, including mummies, ceramics and bones, that Bingham excavated and exported from Machu Picchu. On September 14, 2007, an agreement was made between Yale University and the Peruvian government for the objects' return. On April 12, 2008, the Peruvian government said it had revised previous estimates of 4,000 pieces up to 40,000. Soon after Bingham announced the existence of Machu Picchu others came forward claiming to have seen the city first, such as the British missionary Thomas Payne and a German engineer named J. M. von Hassel. Recent discoveries have put forth a new claimant, a German named Augusto Berns who bought land opposite the Machu Picchu mountain in the 1860s and then tried to raise money from investors to plunder nearby Incan ruins. An 1874 map shows the site of Machu Picchu. He married Alfreda Mitchell, granddaughter of Charles L. Tiffany, on November 20, 1900, and had seven sons: Woodbridge (1901–1986) (professor), Hiram Bingham IV (1903–1988) (diplomat and World War II hero), Alfred Mitchell Bingham (1905–1998) (lawyer and author), Charles Tiffany (1906–1993) (physician), Brewster (1908–1995) (minister), Mitchell (1910–1994) (artist), and Jonathan Brewster Bingham (1914–1986) (Democratic Congressman). After a divorce he married Suzanne Carroll Hill in June 1937. In 1982 Temple University Press published Char Miller's doctoral dissertation on the Bingham family titled "Fathers and sons: The Bingham family and the American mission." Bingham achieved the rank of captain of the Connecticut National Guard in 1916. In 1917, he became an aviator and organized the United States Schools of Military Aeronautics at eight universities to provide ground school training for aviation cadets. He served the Aviation Section, U.S. Signal Corps and the Air Service, attaining the rank of lieutenant colonel. In Issoudun, France, Bingham commanded the Third Aviation Instruction Center, the Air Service's largest primary instruction and pursuit training school. He became a supporter of the Air Service in their post-war quest for independence from the Army and supported that effort, in part, with the publication of his wartime experiences titled, An Explorer in the Air Service published in 1920 by Yale University Press. In 1922, Bingham was elected lieutenant governor of Connecticut, an office he held until 1924. In November 1924, he was elected governor. On December 16, 1924, Bingham was also elected as a Republican to serve in the United States Senate to fill a vacancy created by the suicide of Frank Bosworth Brandegee. Bingham defeated noted educator Hamilton Holt by a handy margin. Now both governor-elect and senator-elect, Bingham served as governor for one day, the shortest term of any Connecticut governor. Bingham was reelected to a full six-year Senate term in 1926. Bingham was Chairman of the Committee on Printing and then Chairman of the Committee on Territories and Insular Possessions. President Calvin Coolidge appointed Bingham to the President's Aircraft Board during his first term in the Senate; the press quickly dubbed the ex-explorer "The Flying Senator". Bingham failed in his second reelection effort in the wake of the 1932 Democratic landslide following the Great Depression and left the Senate at the end of his second term in 1933. During World War II, Bingham lectured at several United States Navy training schools. In 1951 he was appointed Chairman of the Civil Service Commission Loyalty Review Board, an assignment he kept through 1953. The Senate Judiciary Subcommittee investigated an arrangement between Bingham, his clerk, and a lobbyist who agreed to pass information on to Bingham's office after executing a plan that was irregular "even by the standards of his day." Bingham took his clerk off duty, and paid his salary to the lobbyist, thus allowing him to attend as a Senate staffer to closed meetings of the Finance Committee's deliberations on tariff legislation. The Judiciary Subcommittee initially condemned Bingham's scheme but recommended no formal Senate action. Subsequently, Bingham decided to label the subcommittee's inquiry a partisan witch hunt, provoking further Senate interest, which eventually led to a resolution of censure that passed on November 4, 1929, by a vote of 54 to 22. On June 6, 1956, Bingham died at his Washington, D.C. home. He was interred at Arlington National Cemetery in Virginia. ^ "SENATORS OF THE UNITED STATES 1789-present, A chronological list of senators since the First Congress in 1789" (PDF). United States Senate. ^ Howard F. Cline, "Latin American History: Development of Its Study and Teaching in the United States Since 1898," in Latin American History: Essays on Its Study and Teaching, 1898–1965. Austin: University of Texas Press 1967, vol. 1, pp. 7–8. ^ Cline, "Latin American History," p. 8. ^ Hiram Bingham, "The Possibilities of South American History and Politics as a Field for Research", reprinted in Latin American History: Essays in Its Study and Teaching, section III "Pioneers, 1900–1918." Austin: University of Texas Press 1967, vol. 1, pp. 58–65. ^ Bingham, Hiram (1911). Across South America: An Account of A Journey from Buenos Aires to Lima by Way of Potosí, with Notes on Brazil, Argentina, Bolivia, Chile, and Peru. Boston & New York : Houghton Mifflin Company . pp. . Retrieved August 7, 2016 – via Internet Archive. ^ a b "Yale Expedition to Peru". Bulletin of the Geographical Society of Philadelphia. vol. 10. 1912. pp. 134–36. ^ Fellman, Bruce (December 2002). "Rediscovering Machu Picchu". Yale Alumni Magazine. Retrieved April 7, 2016. ^ The trail less trampled on in USA Today by Gene Sloan, September 23, 2005: "The iconic mountaintop citadel, discovered less than a century ago by American explorer Hiram Bingham, the inspiration for Indiana Jones, is a thrilling reward after days of exertion." ^ "An Explorer in the Air Service". U.S. Air Service. 4 (December): 3. 1920. ^ Bingham, Hiram Yale University Press, 1920. 260 pp. Balm, Roger. "Discovery as autobiography: the Machu Picchu case." Terrae Incognitae 40.1 (2008): 102-113. Bingham, Alfred M. "Raiders of the Lost City" American Heritage (1987) 38#5 pp 54-63. Bingham, Alfred Mitchell. Explorer of Machu Picchu: Portrait of Hiram Bingham (Triune Books, 1989). Gade, Daniel W. "Urubamba Ramble: Hiram Bingham (1875–1956) and His Artful Encounter with Machu Picchu." in Gade, "Spell of the Urubamba: Anthropogeographical Essays on an Andean Valley in Space and Time" (Springer, 2016) pp. 239-272. 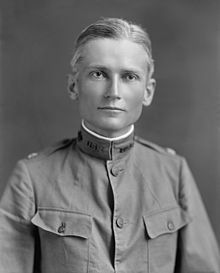 Wikimedia Commons has media related to Hiram Bingham (1875-1956).